What is Shipment Advice in international trade of exports and imports? 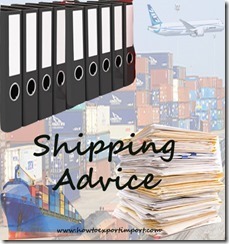 Who prepares Shipping advice – Exporter or Importer? When is Shipment advice being sent? What are the contents in a Shipping Advice? What is Shipment Advice? How to prepare a Shipping advice? Once after shipping goods from your (seller’s) place, You need to send shipping details with complete details of carriers and expected time of arrival at your buyer’s place. Shipping advice helps to track the goods as per details and importer can plan import clearance procedures accordingly. If buyer not received documents in time, from their bank for taking delivery of goods he can keep an alert to get the documents and make sure, all documents are in order to customs clear the goods and take delivery. 1. The purchase order or Letter of Credit number, or any other reference number of contract of the said shipment if necessary. 2. Exporter’s commercial invoice number and date. 4. Shipping carrier’s name with liner name. eg, for sea shipments, MAERSK LINE, EVERGREEN,MSC, HYNDAI etc. For air carriers, Lufthansa, Emirates, Air France, Air America etc. 5. If any freight forwarders involved, their complete contact details at destination with telephone, emails and key contact person’s name. 7. Expected time of arrival at final destination. Once updating shipment advice, the exporter has to keenly monitor about the vessel/flight details and make sure, the details updated with the buyer is correct, once after goods moved out of load port. If any changes in vessel details and expected time of arrival at final destination has to be updated accordingly with the overseas buyer. Sending a Shipping Advice to overseas buyer/importer/consignee is a good practice in international trade of exports and imports. Shipment advice helps importer/buyer/consignee to track the goods on its arrival at destination port. Shipping advice helps buyers/importers/consignees for proper planning to customs clear the cargo at final destination port. Have you satisfied with this article about Shipping Advice in Exports and Imports? Do you wish to add more information about Shipment Advice in international trade of exports and imports? Share your experience below in handling shipping advice in imports and exports. Discuss below about this subject - What is shipment Advice and what are the contents of a shipping advice? What is Third Party Exports? Difference between manufacturer exporter and third party exporter. Muhammad imran: On 01 March 2014 Invoice amount required in shipment advice.If amount mentioned in shipment advice and differ from invoice invoice, may we reject the documents on the basis of amount amount i.e. invoice amount is USD54,000.00 but shipment advice is showing 54,00.00. One of export documents send to italy bank he refused to accept the same against above reason. In LC insurance clause is saying that shipment advice must be sent with original shipping document. We send the correct amount shipment to beneficiary Bank after twenty days but he against refused and discrepancies pointed out lat presented.Kindly guide us what should we do? Further we accept the same and inform them that it is typing error, the said bank sent swift message that asper ISBP typing error not allowed if change of meaning.further How many days does require for removing /rectification the discrepancies. Your guidance is required. Your earliest reply will be very highly appreciated. Prakash Jangid : On 09 August 2016 This is Prakash from Jodhpur, Rajasthan. i have read many topics on your website and gained knowledge regarding many issues. However still i have one question and didn't get answer on it, i therefore writing this mail to you and i hope that you would reply. Questions: - Now adays we can receive payment through paypal in india and we can send shipments to buyer. this is new retail e-commerce trend going on and many sellers from india are selling like this and selling as samples all their orders. Is this fine to counted all their sales as samples while they are receiving payments on each order through paypal or there are some rules which we need to take care? if this is wrong then can you please let me know that how to process these kind of online orders?